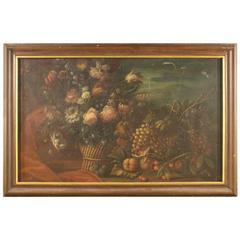 Antique Italian painting from the late 19th century. Oil painting on board depicting still life of good pictorial quality, signed F. Vacchetti and dated 1898 (Filippo Vacchetti 1873 - 1945). Missing authentic, framework with 20th century guillauche wooden frame of beautiful decoration. Painting for antique dealers and collectors in good state of conservation. Sight size: H 35 x W 50 cm.